FLIPPIN, Ark. 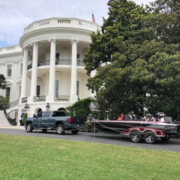 – Flippin, Arkansas-based Ranger Boats had the honor of representing the state of Arkansas at The White House this week. The event was part of President Trump’s “Made in America Product Showcase” on Monday, July 23, highlighting each state’s effort and commitment to American-made goods and products. The showcase featured a limited-edition Ranger Z521L ICON prominently displayed on the White House South Lawn. 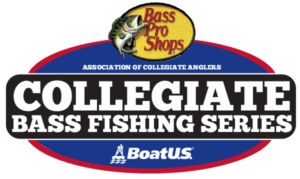 Along with the Z521L ICON, Ranger Boats ambassador and pro-angler Jimmy Houston was on site to help represent the iconic boat brand. 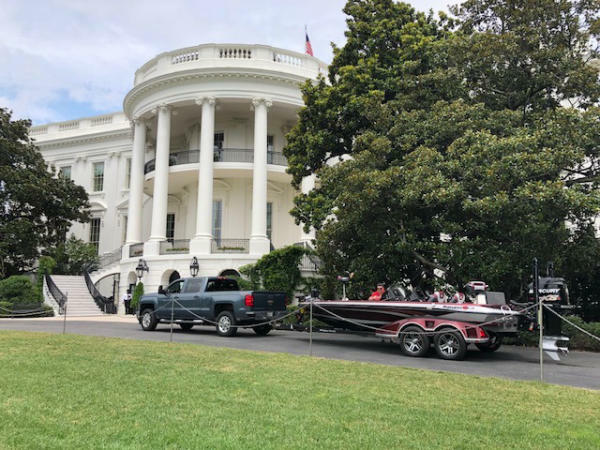 Houston was joined by White River Marine Group officials and longtime Ranger dealer Brian and Chris Lancaster, of MARE Inc. – the Mid-Atlantic’s Bass Boat Headquarters.